For those of us lucky enough to be working these days, a nine to five gig is a blessing, but for our housebound feline room mates, this time of the day can be downright traumatic. The consequence of forming a tight and routine bond with our animals can often be displayed as anxiety when we leave the inner sanctum and decide to leave for the day. Cats are solitary by nature. They can get along just fine without the company of another cat, although there are many exceptions to the rule. While maintaining a life of independence, they tend to bond strongly with their human caretakers, even when they are paired off. After all, we are EVERYTHING to them! Humans are the providers of love, conversation, physical comfort, food, water and interactive play. Another cat simply can not provide this. How do you know if your cat is stuck to you like Velcro? My guess is…. you won’t even have to ask this question! Over-attachment to the owner such as following the person to every room of the house (heal chasing). 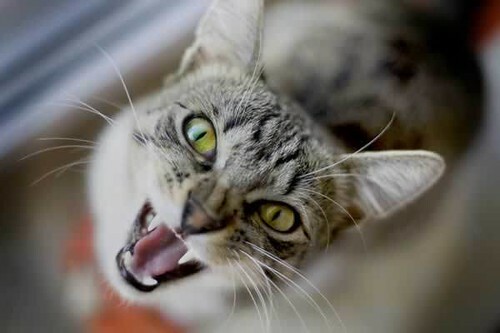 Vocalization (crying, yowling, meowing) right after the owner has left or even when you are sleeping. 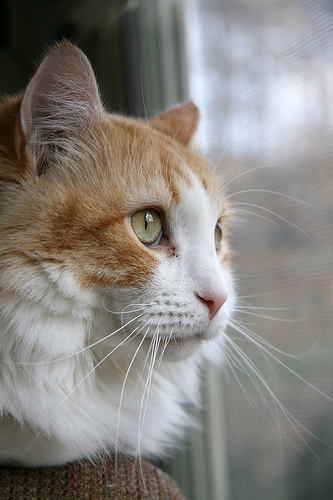 Anorexia – the affected cat is often too anxious to eat when left alone. Inappropriate elimination – often in the form of urine marking. Deposits of urine or feces are often near to the door from which the owner has departed or are on that person’s clothing, bed sheets, or places like bath mats, rugs and behind or under furniture. Excessive self-grooming. This starts as a displacement behavior but can progress to compulsive self-grooming if unchecked. Destructive behavior – rare, but some cats may claw and scratch door edges presumably in an attempt to escape their solitude. This can also happen while you are sleeping to get you to wake up and give them attention. 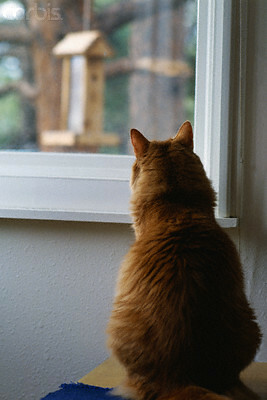 Giving the cat a view of the outside world! Add climbing structures, cat trees, open windows with screens. Strategically position bird feeders near the windows with a view. Leave toys all over the house and change it up every now and again. The same defeated mouse that your cat played with two days ago is no longer a challenge. Hide toys in creative places like the peek-a-boo box above. 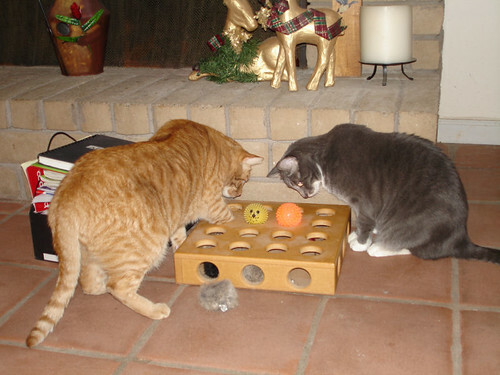 Putting the day’s ration of dry food in a puzzle toy will keep your cat focused on eating instead of your absence. Although cats with separation anxiety tend not to eat when left alone, hunger is a great motivator when other sources (YOU) are no longer available. Some caveats apply if cats refuse to eat for more than a day or so. 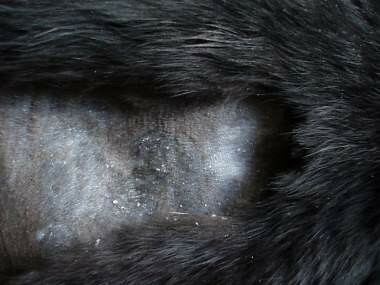 Consult your local vet if this turns out to be the case and try to work out some kind of compromise. It can get tricky. Leave the radio on. The “white noise” effect of the radio drowns out the otherwise perturbing sound of silence. We find that classical music has positive effects on loneliness. If behavior modification by independence training and environmental enrichment do not work it may be necessary to resort to anti-anxiety medication for the cat for a while. 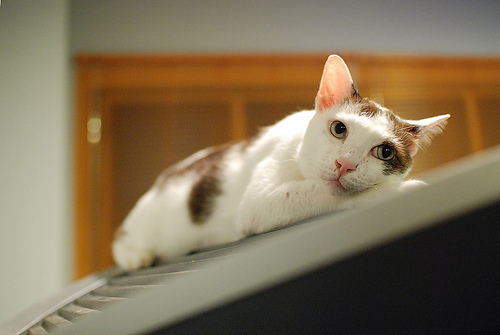 Consult with a veterinarian about the use of drugs like Prozac to help calm an anxious kitty. Ok, Now go to work and rest assured that kitty is not making long distance calls, ordering pizza or rearranging your apartment while you are away.